A rare World War 1 Royal Flying Corps Albert Medal to 1st Class Air Mechanic Harrie Stephen Harwood is offered in our 20th Febuary 2019 medal and militaria auction with an estimate of £6,500. Harrie Stephen Harwood was born in Malton on 10th July 1884, he was educated at Worcester Grammar School, and after he left school he worked in the Audit Office of the North Staffordshire Railway Company. He later served as an Observer on Probation in France from October 1916 to February 1917 and passed all tests and he returned to the UK on 7th March 1917, prior to being commissioned on 23rd May 1917 for service as aircrew. He was injured in an aero accident at Norwich on 19th October 1917, served some time at the Turnberry School of Aerial Gunnery, promoted Lieutenant on 24th November 1918 and served with 141 Sqn before being transferred to the Unemployed List 31st October 1919. During WW2 he was appointed Pilot Officer on probation in Admin & General Duties Branch on 18th June 1940, promoted Flying Officer 18th June 1941 and Flight Lieutenant on 1st January 1943. He relinquished his commission on 10th February 1954 and died in 1975. 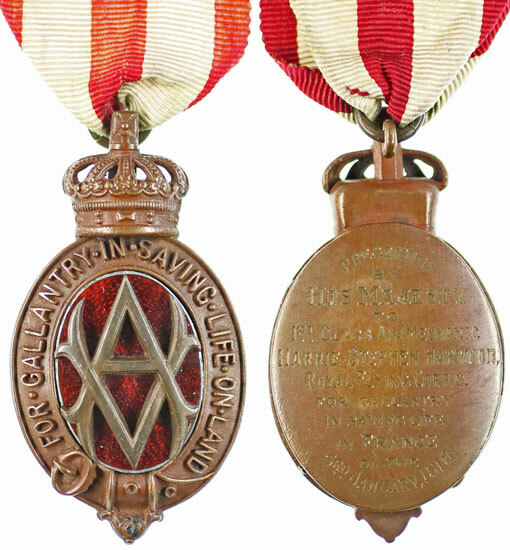 There was only 1 gold and 10 bronze Albert Medals awarded to the RFC in WW1.